A TIGER at Australia Zoo has given new meaning to being hot and bothered. Australia Zoo keeper Che Woolcott, 41, left work in an ambulance yesterday when a 120kg cat swiped him after becoming frustrated by the heat. The experienced tiger handler was taking 12-year-old sumatran tiger Ranu for a walk in bushland as part of daily "enrichment" activities yesterday morning when the big cat scratched him. Ranu's claws punctured the tiger handler's head and arm. After first aid was administered by zoo staff the handler was taken by ambulance to Nambour Hospital, where he received stitches and was later released. "Ranu was a bit frustrated with the heat," Mr Woolcott said in a video circulated on Twitter yesterday afternoon by Australia Zoo's Terri Irwin. "He wanted to go one way and we wanted to go the other. "(He) let off a bit of steam and I got a few claw marks. These things happen working with tigers." UNPERTURBED: Ranu looks at his reflection in the balloon. Australia Zoo curator Kelsey Engle said Ranu had not "attacked" the handler, but had "thrown out a paw". An ambulance service spokesman confirmed the handler had "deep puncture wounds" and scratches. Mr Woolcott would return to work "within days", Ms Engle said. Aside from the zoo's rigorous daily protocols, no special workplace health and safety investigation would be conducted, because yesterday's incident had not been serious, she said. Ranu had spent the rest of yesterday going about his normal activities, and had not been sedated, Ms Engle confirmed. Tiger shows would continue as normal, with no cancellations. Ms Engle said Mr Woolcott had been "upbeat" about the incident. "The cool thing with Che and Ranu is they have this great relationship," she said. "Che was quite upbeat and quite lively throughout the situation, and it was when he sat down to have a rest that we thought it would be best to call the ambulance and get him off to medical attention nice and quickly. "Then he can get sorted and get back here at work." 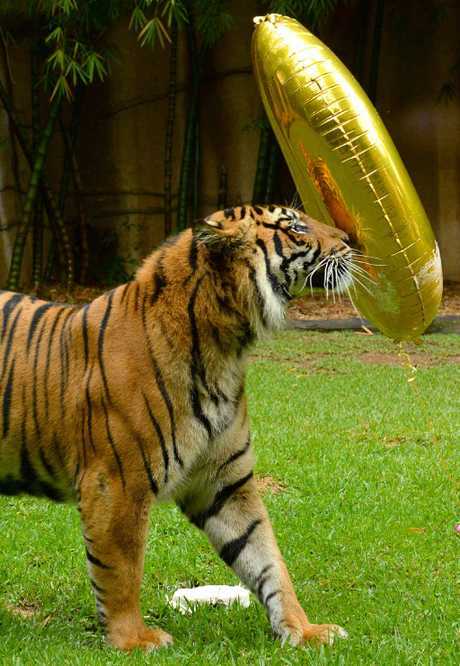 According to Ranu's biography on the Australia Zoo website, the "mischievous" Ranu saw himself as "the boss" and was always first to play with or annoy other tigers. The website said: "Ranu pictures himself a little bigger than what he really is and is continually challenging the others around him, including the bengal tigers." It's not the first time a big cat has hurt a handler at Australia Zoo. 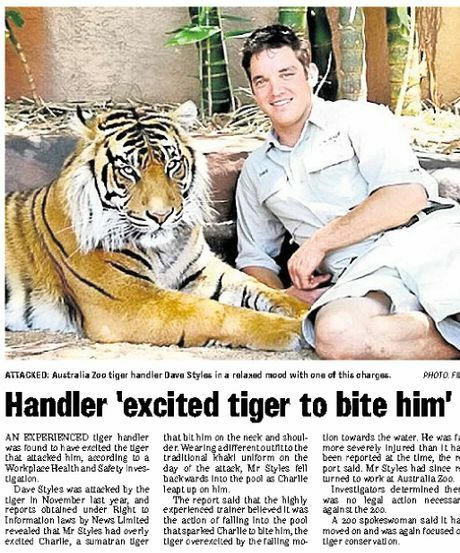 In November 2013, Australia Zoo tiger handler Dave Styles, 33, was seriously injured when a tiger that had been in his care since it was a cub became over-excited. 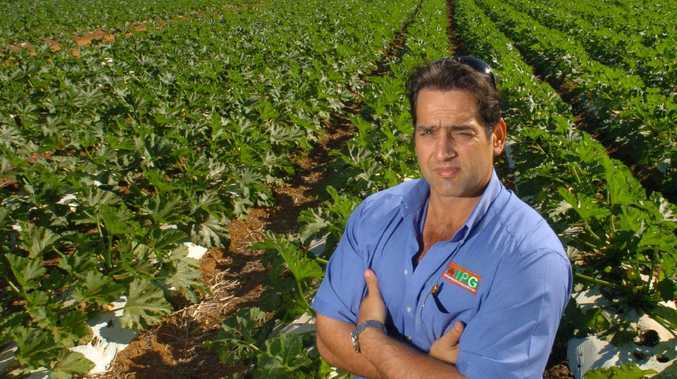 Mr Styles was far more seriously injured than was reported at the time of the attack, a Workplace Health and Safety report found. The report said the incident had been triggered by a change in outfit from the handler's traditional khaki uniform and from falling backwards into a pool. The Workplace Health and Safety report also noted that the experienced tiger handler had believed it was the action of falling backwards into the water that had caused the tiger to become over-excited and leap on him.